Engaging the community in the preservation, education, and celebration of our heritage. 2017 marked the 55th anniversary of the Cedar Falls Historical Society. Our organization was first formed on June 27, 1962 at a meeting of the Cedar Falls Chamber of Commerce with the goal "to preserve and procure items of historical value to the community." One year later, the Chamber appointed a "Historical Committee" led by chairman Iver Christoffersen, and the Cedar Falls Historical Society incorporated on March 22, 1964. Today, the Cedar Falls Historical Society remains much more than the sum of its museums and buildings. Children experience a one-room schoolhouse education each summer at the Little Red Schoolhouse; individuals research their ties to Cedar Falls in our extensive archive and library; families make a tradition of visiting our house museum during Sturgis Falls; school groups learn about early Cedar Falls industry at the Ice House Museum; and members exchange stories about the families, homes, businesses, and community organizations that have made Cedar Falls what it is today. 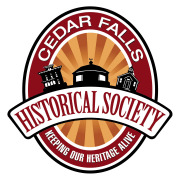 With the continued support of our volunteers, donors, and members, the Cedar Falls Historical Society looks forward to continuing to keep our heritage alive well beyond our fifty-five years. Would you recommend CEDAR FALLS IOWA HISTORICAL SOCIETY?